”Let it go, let it go… Can’t hold it back anymore…” We ALL know this song. 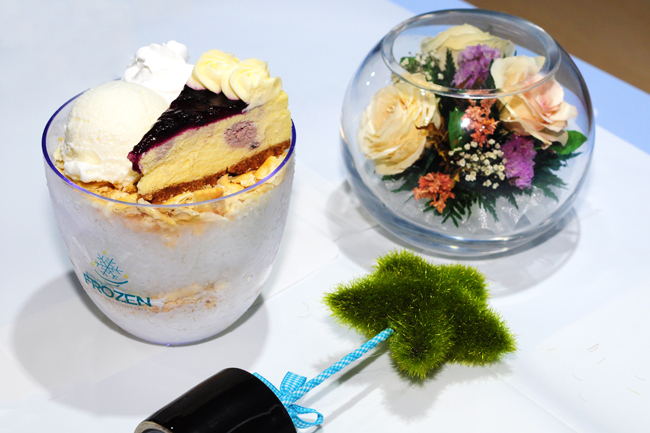 Snow Queen Elsa and Princess Anna will probably not be able to hold back their excitement if they know about a “Frozen” themed café at Clementi’s City Vibe. 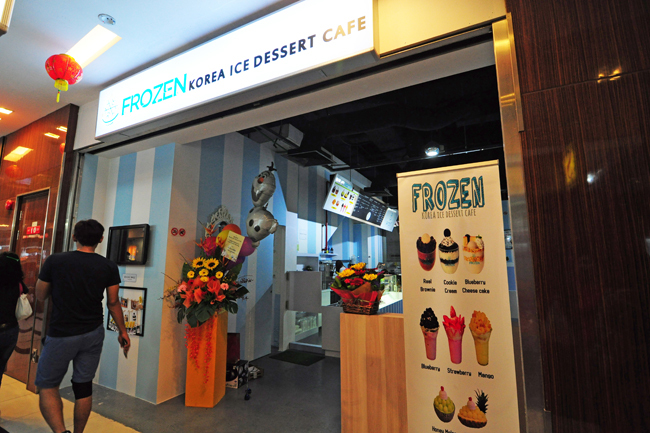 Not to be confused with Frozen by A Thousand Blessings that sells frozen yogurt in Toa Payoh, Frozen specializes in Korean ice desserts such as Korean Bingsu and pastries. 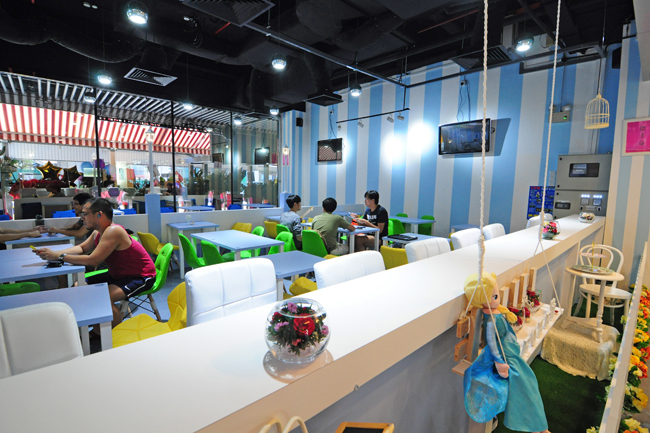 The entire café is inspired by Walt Disney Animation – Frozen, the top box office animation movie in 2013. We were greeted by Elsa (I mean a doll) at the entrance and an interior painted in white and blue, mimicking an ice palace. Other selection ranged from Smoothie Yogurt ($6.90 – $8.90) to Pastries ($6.90 – $9.90). The children seemed to love this place, indulging in pretty Disney- inspired desserts in an “ice palace”. After all, the fairy tale had become a reality. Whereas for the adults… we were not too sure. 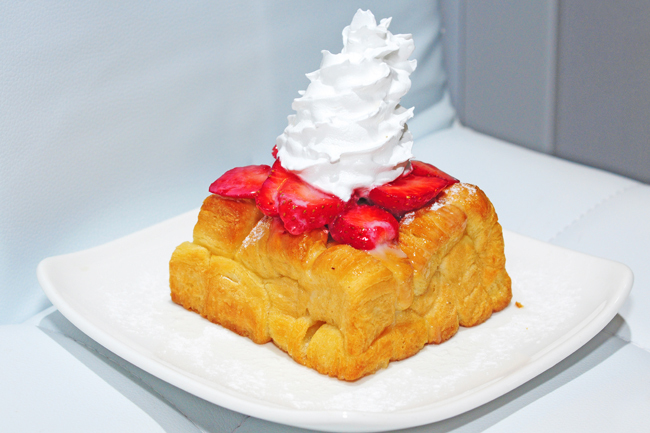 The Strawberry Pastry ($9.90) came with a big slab of whipped cream on top, looking like snow. The toast was crispy on the outside and buttery on the inside. Perhaps, softserve would be a better alternative to the whipped cream. 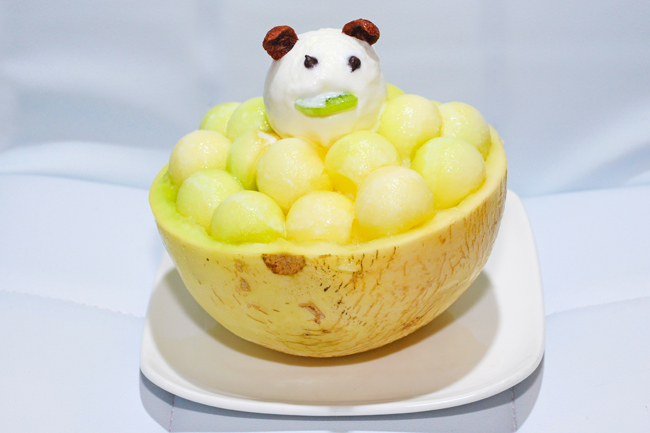 The Honey Melon Olaf Fruit Castle ($12.90) came looking like a snowman with a big belly (I wonder why a big belly. Olaf is the thin version snowman though). 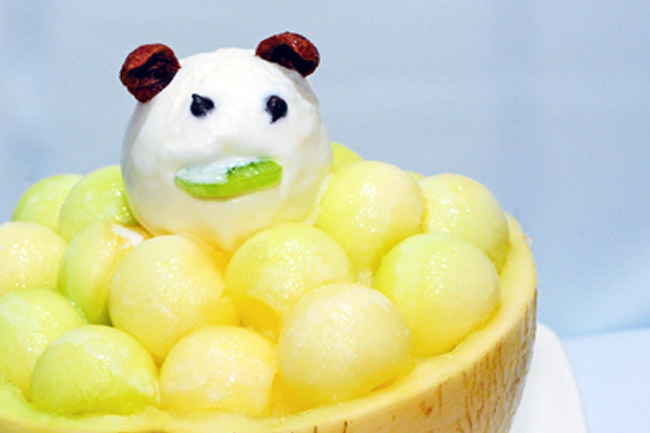 The shaved ice within the honey melon bowl was pretty coarse. We actually waited for the shaved ice to melt before eating it because the texture reminded us of coarse ice kachang we could get in some hawker centres. 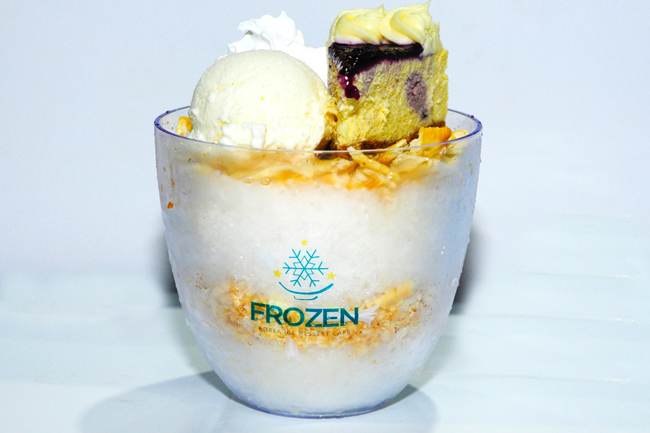 The Elsa Blueberry Cheesecake ice flakes ($17.90… wait, isn’t it expensive? Will it be as good as Nunsongyee’s since their prices are comparable?) came in a tall standing bingsu bowl with a cheesecake and milk ice cream on top of it. The shaved ice could be rough, and may make a young Princess Anna cry if she sinks her teeth into it. Elsa is no longer the highlight of this café, she needs to work her magic though. Frozen will probably need to improve on their existing quality of their food and not solely depend on the popularity of Frozen the animation to attract the kids. So, are you giving it a go or letting it go? *Post written by Daniel’s Food Diary Cafe Correspondent Nicholas Tan. I think your story not true…. I also been to the shop..! Actually Serving quite slow but i think taste not bad..
Esp their bread is nice!! And ladyboss is korean she also teaching us how to eat brownie bingsu!! Hi Yingjie, sure, taste is always subjective. We did try Korean bingsu and toast from quite a number of shops (at least 6-7) in Singapore. To put things into perspective, they may not come across as strong taste wise. Just some constructive feedback for them to stay ahead in this extremely competitive market.